Get our library card by sending the application form online! You can collect your card after two working days. Please present a valid photo ID. The library card is for your own personal use only. You are responsible for all material borrowed on the card. If you should lose your library card, please contact the library staff as soon as possible. Also please notify the library of any changes to your contact information. To use our services and borrow materials you will need our valid library card. Loan periods vary based on the type of item you're borrowing, Please check the due dates on your receipt or at My profile > Checked out items section on Masto-Finna. You will receive an advance notice of impending due dates by e-mail. The automatic message arrives 2-3 days before the loan is due. Please check that your contact information is up to date at My Profile on Masto-Finna. The fine for overdue materials is charged beginning on the first day overdue and will be accrued each day regardless of e-mail delivery issues or other technical difficulties. You are able to renew your loans max 10 times at Masto-Finna, with the exception of items reserved by another customer. 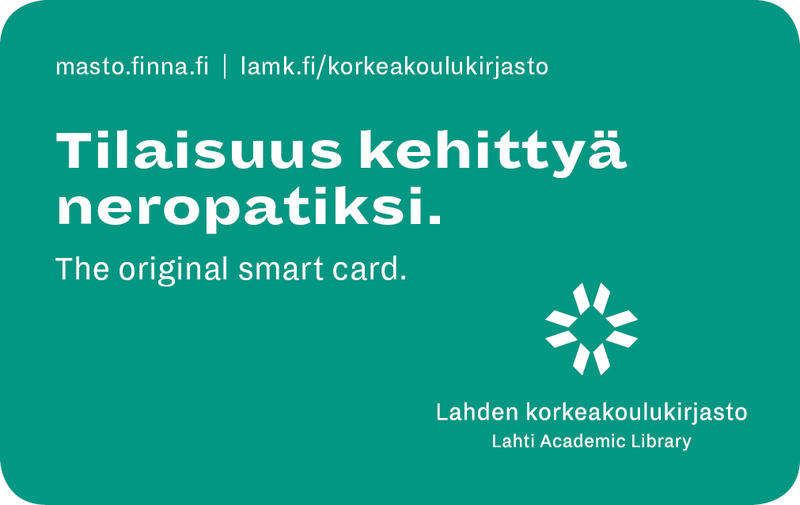 If you have problems with renewals, please contact library[@]lamk.fi or library staff. You can make online reservations for free at Masto-Finna for material both available or lent out. However, at Scientia requests directly from shelf are not in use. Please note that there are two kinds of reservations. You will receive an e-mail when the item is available for pick-up. The reserved item will be held for you for one week. Please note, that there is a fine for reservations not collected. You cannot reserve material that you yourself already have on loan. Reservations made by library staff are subject to a fee. We update our personal data protection practices to correspond with the requirements of EU's General Data Protection Regulation (GDPR) that took effect May 25, 2018. We delete all identifiable customer information from our reservations shelves. In future, you will find your reservation with an anonymous code. Academic Library records only customer information imperative for identifying and individualizing a person.Please check your own personal data at Masto-Finnas My Profile tab.